With the release of Ruby container support on AWS Elastic Beanstalk, it is now possible to deploy Rails (or any Rack-based) applications onto the AWS infrastructure in just a few easy steps. The container is backed by Amazon EC2 and automatically provisions the machines to use Phusion Passenger (with nginx under the hood). You can run your own local database with your application, or better yet, you can have Elastic Beanstalk automatically set you up with a MySQL database backed by Amazon Relational Database Service (RDS). All of the machines sit behind a load balancer with auto-scaling support automatically configured so you don’t even have to think about ops. Scaling is built-in. But enough with the awesome features. Let’s deploy an app! Before we can deploy an application to Elastic Beanstalk, we first have to create one. Let’s generate an empty Rails skeleton and set it up against a Git repository. We will be using the repository later to deploy our app. At this point we have an application, but we have not yet configured it to deploy to Elastic Beanstalk. In order to do that, we need to install the AWS Elastic Beanstalk command line tool. This package provides us a binary, eb, which we will use to manage and deploy our applications. We can now initialize our application with the CLI tool by typing eb init. The tool will ask us for some information about our deployment such as our AWS credentials, the deployment region, and the solution stack we want to deploy. For our case, we want to use the "64bit Amazon Linux running Ruby 1.9.3" stack. The tool also asks if we want to setup an RDS database instance for our environment. Let’s answer "no" on that one for now. $ git add .gitignore && git commit -m "Ignore .elasticbeanstalk from Git"
You can see more examples of setting up a project with the eb tool on the Amazon Web Services Blog. Waiting for environment "fooapp-env" to launch. Application is available at "fooapp-env-djr9ywimiu.elasticbeanstalk.com". The eb init command we ran above actually did some nifty things behind the scenes. The most notable thing is that it setup a Git subcommand named aws.push that can push our code to the environment. This means that whenever we need to deploy our app, we just have to type git aws.push. Since our environment is running, and our app is ready, let’s do that right now! Notice that gems listed in our Gemfile were automatically installed, assets were precompiled, and, if we had any, database migrations would have been run too. Migrations and asset compilation happen by default for any Rails 3.x application. 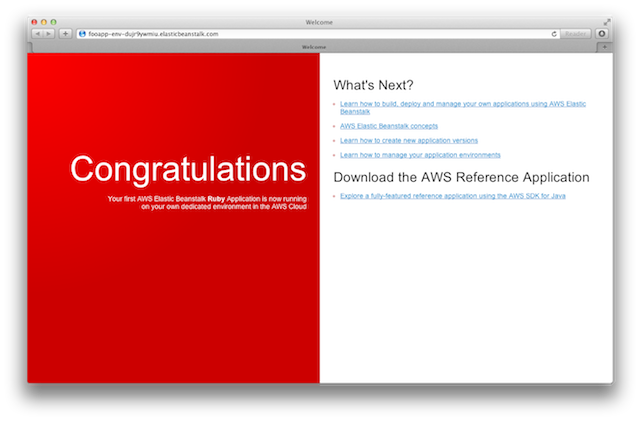 All we have to do now is update our application, commit to our Git repository, and execute the command git aws.push to push our new changes to deploy new versions of the app. Migrations will be run, and our assets will get updated. To run commands and drop environment variables onto your system via your app during a deployment, you can add a special .config file to the .ebextensions directory in your project root. The config file is formatted as YAML, and is documented on the Customizing and Configuring AWS Elastic Beanstalk Environments documentation page. For reference, here is a sample .ebextensions/redmine.config that runs some extra hooks for installing Redmine on Elastic Beanstalk. Note that the environment variables are not necessary; BUNDLE_WITHOUT and RACK_ENV already default to the values below. We’re just setting them as an example of some config we might want to perform. RAILS_SKIP_MIGRATIONS — set this to true if you don’t want Elastic Beanstalk to run migrations on your behalf. You may want to manage migrations yourself. RAILS_SKIP_ASSET_COMPILATION — set this to true if you don’t use asset compilation in your Rails app. Note, however, that your Elastic Beanstalk container is already configured with a JS runtime to properly handle asset compilation, you do not have to do anything fancy like install the therubyracer gem. It should just work. The final-but-very-optional step for using the Ruby solution stack in Elastic Beanstalk is to hook up an RDS Instance to your application. If you are running any kind of real world application, you most likely have some database. If your application uses a relational database, you can take advantage of Amazon RDS for access to a MySQL (or Oracle) database. Fortunately, the setup for this is extremely simple. Remember when we said "no" to creating an RDS DB Instance when we ran eb init? Well, we can initialize another application in the exact same way, but instead of no, we can say yes. We will be prompted to provide a password for this database, but everything else will be directly configured by Elastic Beanstalk on our behalf. And RDS should now be fully configured for our Rails application. Passenger relies on a config.ru Rack file in your root application directory by convention. Passenger also relies on a public/ directory for your static assets located in your application root. Passenger needs both of these paths to exist in order to detect your Rack/Rails application. In a Rails 3.x app, these paths already exist, but if you are rolling your own low-level Rack application, you need to make sure that they are created. Once they have been setup, your application is ready to be tested as if it were deployed to Elastic Beanstalk. You can consult the Phusion Passenger documentation for more information about how to run your application on this snappy webserver. Setting up RDS is just a matter of using the configuration values provided to your application through standard environment variables. And of course if you need to dig deeper and customize settings, you can do so by adding a .ebextensions/config.yml file. There is of course plenty you can do with an Elastic Beanstalk application, and there are plenty more things to talk about with the Ruby solution stack, but hopefully this helps you get a Rack-based application up and running in just a few minutes!